Fresh air is great way to allow employee to alter the daily routine of a 9-to-5 workday. New York City offers more than just fresh air, stunning city views are another amazing benefit to an office space. A roof deck is a great way to highlight both features. Along the skyline, tower buildings offer refined and chic roof decks. These retreats present an open space with a seating area and greenery. Offices with access to these enticing roof decks garner envy as many only allow access to the tenants and employees. To add to the envy, commercial spaces with a roof deck in Manhattan are rarely readily available. Many roof decks are typically owned within a condominium, co-op, or already in a long-term lease. With no surprise, many commercial properties are including roof decks in their new construction. Many of the new roof decks are being built in Brooklyn’s hippest neighborhoods. The demand for roof decks are rising as large businesses, boutique firms, and many residential properties are requesting a terrace. A roof deck is always an option even when the commercial building was constructed without one. As a general rule, constructing a roof deck is unlikely an option with leased space but more common in a condominium or co-op purchase. A roof deck is a structure level to or above the space supported by an architectural structure frame, but without a roof. A porch and deck are elevated floors that are level or above the first story of the structure. A major difference between a porch and deck is a porch gives access to the primary entrance. The New York City Building Code §3300 dictates construction safety and specifically discusses porches and decks. Note: A deck constructed with a roof may be considered an additional room. This consideration may require different zoning laws applying to the New York City Construction Code. A pool should not be built on a deck or porch unless it has been engineered to support the weight. Water adds considerable weight to a structure. Floor Loads: The floor loads should be able to support at least 40lbs per square foot. Materials: Flammable materials are not to be placed within 3 feet of the zoning lot line. Some flammable materials are wood, sheet rock, or stucco. Anchorage: Construction must include proper anchorage, and not just nails. Bracing: For an elevated deck or porch, bracings are mandatory at the columns and beams. Safety Railings: All safety railings must be at minimum 42 inches high. Railing/Post Spacing: The rails or posts may not contain more than 5 inches of space between them. Deck & Balcony Depth: According to the New York City Zoning Resolution & NYC DOB TPPN 4/03, the deck may up to 8 feet from the building. Distance to Property Lines: There must be at minimum 3 feet between the deck or porch sides and the property line. Storage: It is not permitted to have storage below a deck or porch. Are you in the market for a modern and polished roof deck excellent for enjoying lunch, team meetings, or simply taking a break? 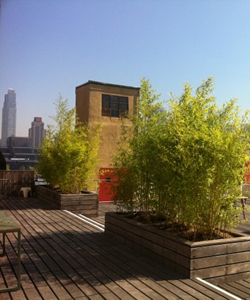 Are you dreaming of an office roof deck? 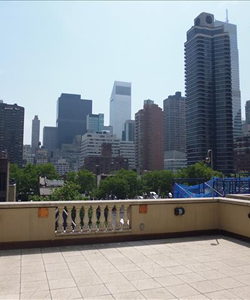 A roof deck provides gorgeous views of Manhattan, the Hudson and East River, and so much more. Our brokers can provide information and any available spaces with a roof deck to you at no obligation or fee. Call us today to quickly get your search going.